SpineAlign Pillow Review - Different Shape Pillow for Better Alignment? The way we sleep is one of the very first habits we form, and every sleeper does it differently. That’s why the ‘one-size-fits-all’ method would never work in the world of bedding — folks need sleep products that are as varied and changeable as their own bodies. 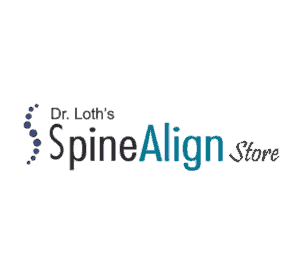 Dr. Loth, a chiropractor, designed the SpineAlign pillow to be an adjustable pillow built specifically for folks who sleep on their backs and sides. Stomach sleepers have myriad pillow options too, but this particular pillow focuses on keeping the posture of back and side sleepers in healthy alignment no matter how much tossing and turning they do. 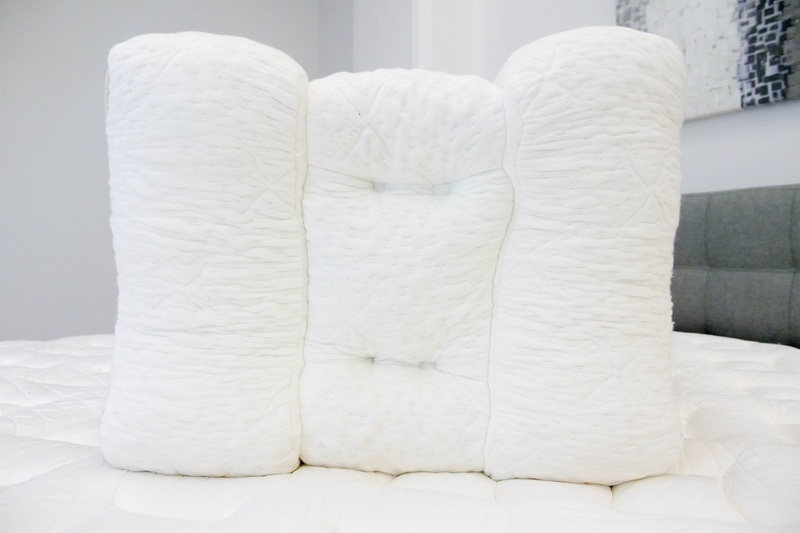 In this SpineAlign pillow review, I’m going to test the full performance of this pillow and find out if it’s the answer that back and side sleepers have been searching for! No time for the dreamy details? Click here to skip right to the review summary. Take 5% off your order! Crafted by a chiropractor, the SpineAlign pillow was designed to help back and side sleepers keep healthy posture throughout the night. Take 5% off your order with the code SLEEPOPOLIS5! 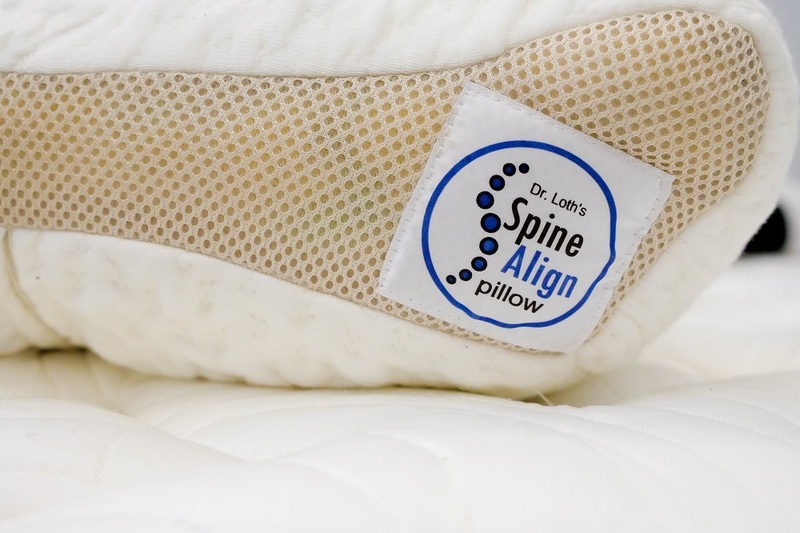 WHAT’S THE SPINEALIGN PILLOW MADE OF? The SpineAlign is structured with three chambers: two for side sleepers, and one middle chamber for folks who sleep on their backs. The sides of the SpineAlign were engineered with higher loft, while the middle chamber is thinner and flatter. I happen to be both a back and a side sleeper, alternating throughout the night. When using the SpineAlign to sleep on my back, the high loft of the sides actually serve to keep my head comfortably in place, making it harder to accidentally slip into an awkward neck position. Each chamber is filled with a proprietary blend of shredded fiber and foam. The shreds vary in size, but are all less than an inch big (imagine pieces of popcorn). So, if you’re looking for that thick, unmoldable slab of memory foam, this pillow is not for you. 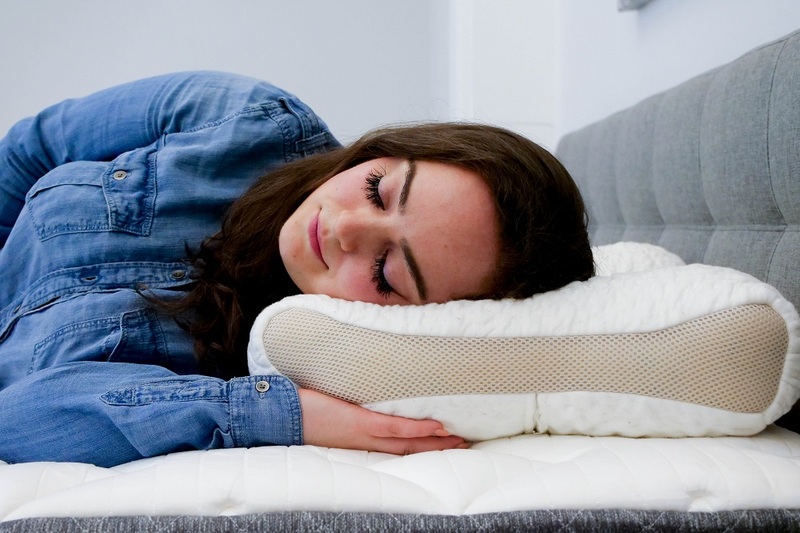 By using a shredded mix of fiber and foam, the pillow has a quick response to pressure while also offering malleability. 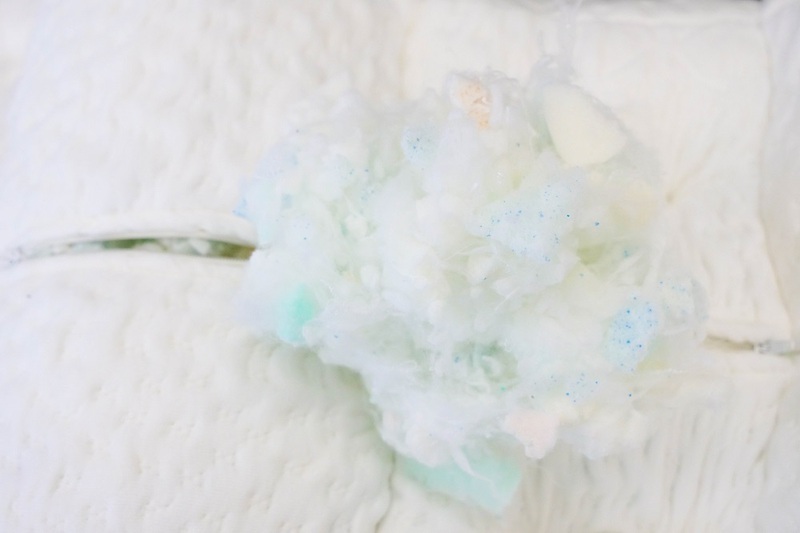 Shredding the foam (and that’s literally how they do it) enables the individual pieces to move independently, allowing the sleeper to squish, press, or punch their pillow into whatever shape best suits their desires. Because of the specifically contoured shape of the SpineAlign, this pillow is probably less intended for reshaping than a standard style. 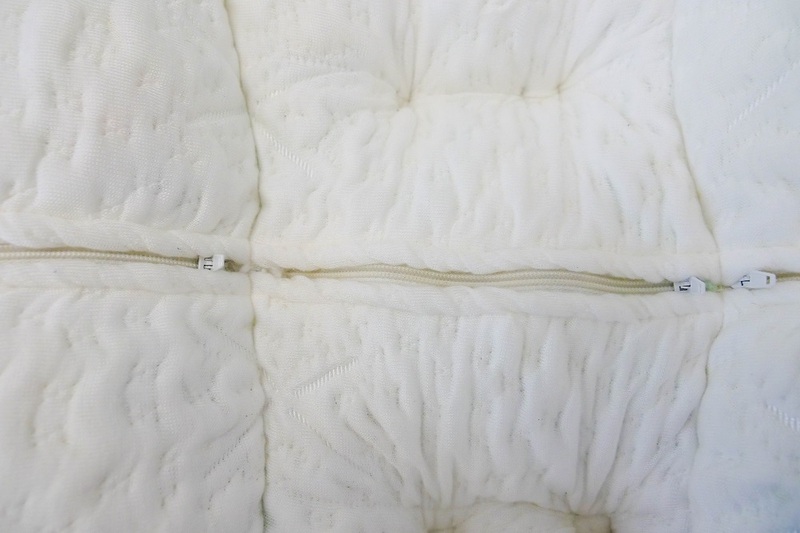 However, each chamber has a zipper along the back side of the cover so that the sleeper can remove, shift, or generally manipulate the filling according to his or her preference. If you’re like me and you heat up during the night, you’ll be glad to know that the fill is also designed to be breathable and temperature regulating. The Tencel fabric of the cover in conjunction with the foam’s open cell structure work together to enhance the breathability and airflow of the Spine Align pillow. The foam displaces the air rather than absorbing and storing the sleeper’s body heat. Interested in sleep products that keep you cool? Check out our list of the best cooling mattresses! An interesting feature in this pillow’s construction is that Dr. Loth designed the two side chambers to be different heights in order to accommodate the varied heights of side sleepers. According to Dr. Loth, the side with higher loft is intended for sleepers who are 5’7” and above, while the short side is for folks shorter than 5’7”. The difference can be spotted by a quick examination of the pillow, but if you’re unsure about which is which, simply look at the mesh side-paneling. The side bearing the company’s logo is the side for taller sleepers, and the side without the logo is meant for folks (like me) who didn’t inherit the tall gene. It’s worth noting that it is not unusual for brand new foam products to emit an unpleasant odor at first, and the SpineAlign is no exception. Similar to fresh paint or a new car, new foam products experience something called ‘off-gassing’ which happens when the compounds inside your new product begin to settle and break down. This is very common and not at all toxic — it’s just malodorous. After I used the pillow for about a week, that new-foam-smell was replaced with Patchouli, hairspray, and other unique-to-me scents. The cover of the SpineAlign pillow is soft and breathable, made from a sustainable fabric known as Tencel, as well as two strips of mesh paneling along the sides. Tencel (commonly referred to as Lyocell) is a cellulosic fiber made from dissolving wood pulp using recyclable solvents. Unlike some traditional fibers, Tencel’s chemical processing is nontoxic; if you’re looking for a fabric with a small eco-footprint, Tencel is a good option. Simply put: Tencel is strong, absorbent, eco-friendly, and very soft. You can, of course, cover your SpineAlign with a pillowcase, but the Tencel fabric is so soft, you don’t really need one. Another perk to this material is that the fibers it’s composed of are hydrophilic and very, very small. This means that Tencel material is very absorbent of moisture making the fabric resistant to wrinkles, and extra breathable. In my opinion, a downside to this cover is that the zippers on the backside of the pillow are not completely hidden, so this is not a flippable pillow. If I’m enjoying a nap and I accidentally smudge some mascara on one side of the pillow but don’t feel like getting up to wash the cover right away — I can’t just flip it over and finish my siesta lest a zipper gets caught in my hair or pokes me in the eye. While the cover fabric is undeniably soft, I wasn’t completely comfortable using the SpineAlign right away. The nature of the shredded foam offers quick recovery and good pressure relief, however there was some fill manipulation required on my part before I felt like I was sleeping on my pillow. Once I adjusted the fill to provide personalized loft and support, everything came together for me. 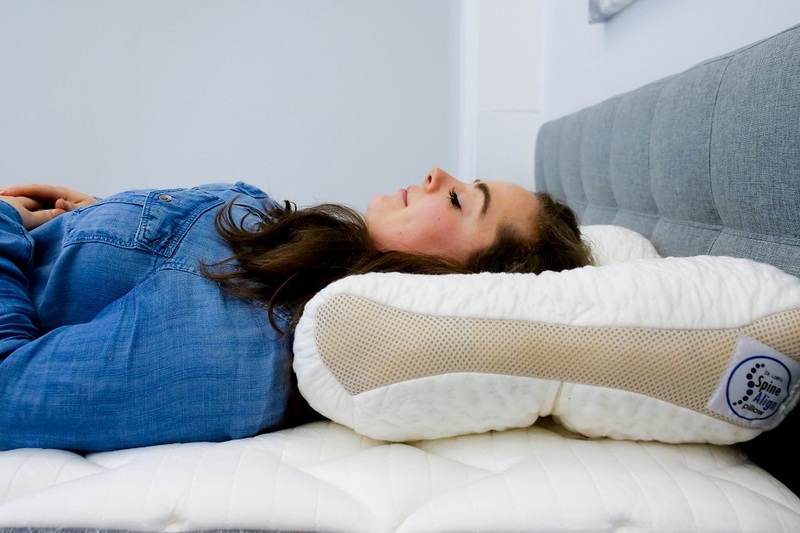 This pillow has a lot of personality, and it does take some tweaking in order to adjust it to your personal preferences; but if you’re willing to be a little patient and experiment with the filling, I think the SpineAlign is helpful accessory for back and side sleepers. Though the thicker side chambers might look more inviting than the thin middle chamber, I ultimately found lying on my back to be the more comfortable position. The middle chamber of the SpineAlign allows my head to sink into the pillow without feeling trapped or restricted. When sleeping on your back, the side chambers do offer a nice place to rest your temple as you doze off. A feature of the SpineAlign pillow that pleasantly surprised me was how comfortable it is whilst sitting in an upright position against the headboard of my foundation. Typically, when sitting up in bed to read a book (or more likely, browse Instagram), I have to pile a few pillows behind me to support my back properly. Wedging the SpineAlign between my back and the headboard offers a comfortable level of support. This pillow may not have been designed for this purpose, but it’s definitely a perk! WHO SHOULD TRY THE SPINEALIGN? Sleep on their back or side – If you’re a back and side sleeper, this pillow was literally designed for you. Its contoured shape and shredded foam blend were crafted with the intent to keep the back/side sleeper’s head and neck and neutral alignment. Like the idea of an adjustable pillow – The zippers on each chamber open up to reveal the internal fill. Take some out or move it around to adjust the pillow’s support according to personal preference. 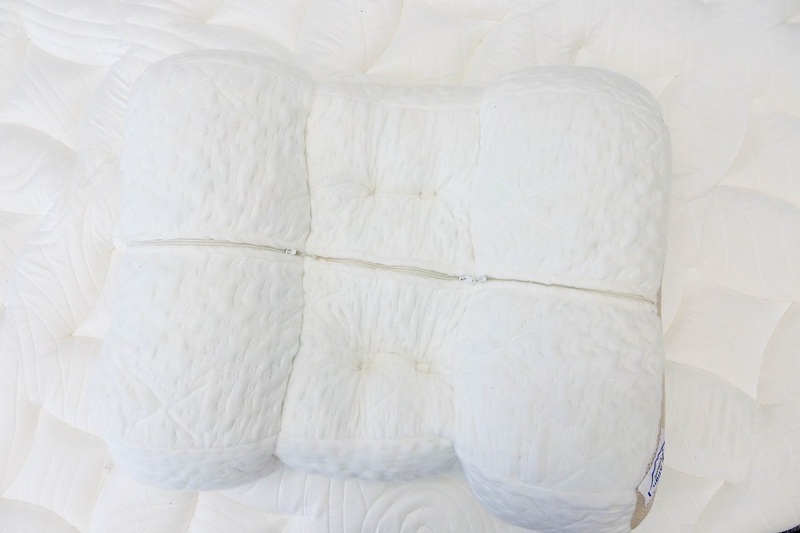 Sleepers who run hot – The outer fabric of this pillow is known for its breathability, and the open cell structure of the internal fill helps to regulate temperature. If you’re prone to heating up at night, this should help keep you cool. Want to keep their eco-footprint small – The cover fabric is made from a sustainable fabric known as Tencel which both recyclable and biodegradable. Trial – You can test the pillow out for a full 90 days before having to make a decision. If it’s not the right pillow for you, send it on back for only the cost of shipping and handling. Click here if you want to learn more about SpineAlign! The SpineAlign pillow is a weird pillow designed to create an amazing level of support for back and side sleepers. The patented design was developed by Dr. Jason Loth, practicing sports chiropractor with 17 years of experience. The pillow allows the spine to achieve ideal alignment without any added pressure points or heat build up. It’s not cheap at $129, but for sleepers who struggle to find the right pillow this can be an excellent fit.